And in many ways it has shown. It would be unfair to say McSorley has played poorly, because he -as much as anyone- is to credit for Penn State's 2-0 record. Nevertheless, nothing pops off the page. His 375 yards passing through two games are the fewest he has thrown for to open the season in his three years starting. The explosive plays through the air are not the bedrock of an offense that has still managed to generate more than 40 points in two straight games. Haymakers have not been the primary punch for this group but a methodical jab and eventually an overwhelming beating via speed and talent. As always the results speak for themselves. Penn State has cobbled together two high-scoring wins in which the Nittany Lions have occasionally looked pedestrian. It's not that Penn State has looked bad, they just haven't looked great in any ascethic sense, maybe the lofty bar set by 24 months of near offensive perfection an unfair judge of progress and success. Perhaps they simply look different. Penn State appears to score points because there is just too much talent on the field not to, but the Nittany Lions are doing so without the artful grace that won the program a Big Ten title in 2016. Whatever the case, it seems to be working. At the center of it all still stands McSorley, who lurks in the background waiting for his moments. On Saturday it was his first run of the night, a short touchdown sprint through the defense almost untouched. A week prior it was a game-tying drive where McSorley flexed his skill, experience and ability and saved a season before it had ever really began. Marrying Penn State's quarterback to a young team is just another of the many challenges facing the Nittany Lions as they prepare for a grueling Big Ten season. It is a question of process, if McSorley has to play at the speed of his teammates or if they much raise their game to match his. 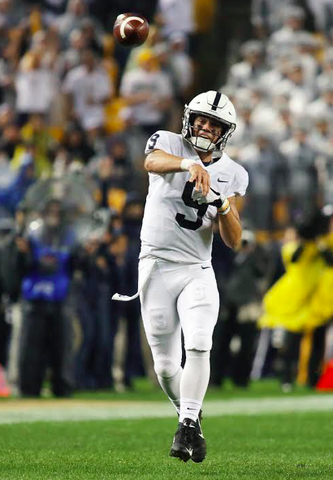 McSorley is in the very least the most experienced Big Ten quarterback if not the most talented, and yet the offense around him is only beginning to make the most of that fact. KJ Hamler's emergence has been a much needed response to McSorley's already proven ability, especially as Juwan Johnson and DeAndre Thompkins have been inconsistent in the season's opening weeks. In turn there are moments where you would forget McSorley's resume if you had not watched it for the past two years. At times he is relegated to the mundane, making reads, handing off the ball, or throwing short passes into the flat. The points and record do the talking, but with the likes of Ohio State on the horizon, it does beg the question how much farther this offense has to go until it is relying on its overwhelming executional merits, not an overwhelming discrepancy in talent. That's not to say Penn State isn't doing both already, but there are moments when the Nittany Lions look young and inexperienced, and it is not hard to imagine equal or better teams making the most of that. "My role has always been to go in and execute our gameplan and if that means handing the ball off and throwing the check-downs the entire game or throwing it deep and taking advantage of some one-on-one matchups that's what I need to be able to do," McSorley said on Saturday. "We were able to do that to a certain extent tonight, but I think we need to be able to do a better job to be able to take advantage of that." Thankfully for Penn State this team will have two more weeks to tune up for a late September meeting with Ohio State. Two more weeks to start to put together an increasingly familiar brand of football. Of course there an alternative, one where Penn State never turns into the kind of team that reminds you of 2016 or 2017. It could be something else, a hybrid of a Joe Moorhead's explosive vision and a more methodical Bill O'Brien style offense that was predicated on a run game backed by timely throws down the field. There has been some evidence of this in the early going. Penn State is dedicated to its running game, something alluded to before the season ever started. The passes so far have been shorter not longer. This is an offense trying to stay on schedule more than trying to knock you out all at once. 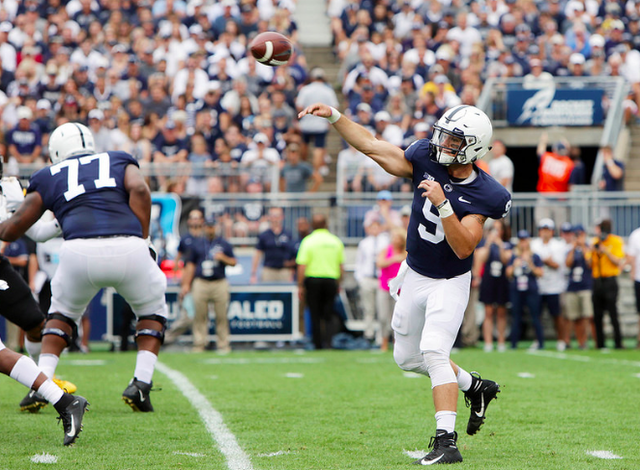 It's a smart way to play when it works because nobody is being asked to do that much, and in turn McSorley can do just about whatever is asked of him. Of course fans are asking for something, a graceful reminder of 2016 and 2017, but as McSorley points out, you can only be who you are. "The guys we have don't do what the guys we used to have did the exact same way," McSorley said. "And our guys thrive in ways and situations that maybe the old guys...it wasn't their forte. So I think we've done a really good job, we were able to score points and keep that going. We're doing really good things but there's a lot for us to get better at and fine tune things so we can become that well oiled machine." Ultimately that might be the lesson of the past two weeks, that Penn State can win in more than just the ways everyone is used to. Maybe it won't always be pretty, maybe it won't even be the same kind of explosive. Well the nice thing about a dramatic slightly ugly, slightly entertaining season-opening game is that there isn't a shortage of things to talk about coming out of it. Honestly you name it, offense, defense, special teams. So basically all of the units on the field and there was something that made you go "Wow that good" and "Wow that's bad." It just depended when and where you were looking.